Embarquez pour une aventure épique lors de cette excursion au parc national des Volcanoes au départ de Hilo. Vous découvrirez le plus grand et le plus actif volcan sur terre avec votre sympathique guide professionnel et visiterez la Richardson Blacksand Beach. Vous en apprendrez plus sur les paysages incroyables qui défilent devant vos yeux et obtiendrez un aperçu des conséquences géologiques et écologiques de Dame Nature sur ce magnifique parc. Découvrez la pépinière d'orchidées Akatsuke, les cascades Rainbow, l'usine de noix de Macadamia Maunaloa et bien plus encore lors de cette visite mémorable qui inclut de nombreux sites touristiques d'Hawaï. Diverse and entertaining. Lots of interesting things to see. Competent and articulate guide. Punctual and kept events moving along. This is an excellent all day trip. The guide was extremely knowledgeable and personable. The highlight is seeing the active volcano at night with orange glowing lava, very cool to see and the best reason to take this tour. The group on the tour was only 5 in number so it was truly personalized service. Other points of interest were waterfalls, walking through old lava fields and lava tubes, the Mauna Loa macadamia nut orchards and visitor center bought lots at their store, an orchid establishment, the Japanese gardens loved the Banyan trees, visiting Big Island Candy for free samples of candy and Kona coffee bought lots there too and visiting beautiful beaches. Not physically strenuous so the tour is suitable for anyone. The sights to see are great but our tour guide was awful. Tour was good, somewhat laid back. A little more narrative about the Hawaiian culture would have been nice but overall we enjoyed the sights. 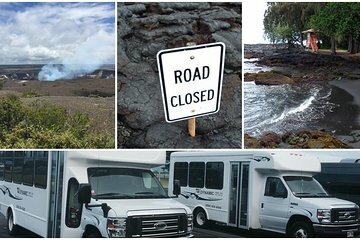 I booked this tour so my partner and I could experience a daytrip to the Big Island during our Hawaiian vacation. Our guide, Nate, gave us many options as to what we wanted to see and do. As luck would have it, only one other couple had booked the tour that day, so we were able to easily choose activities that interested us. Nate took us to Rainbow Falls, the statue of King Kamehameha, sea turtle watching at Richardson Beach black sand, and beautiful in its own right, Liliuokalani Park, the Big Island Candies and Mauna Loa chocolate factories, Akatsuka Orchid Gardens, and finally Volcanoes National Park, where we made stops at the Kilauea Iki Crater overlook, Thurston Lava Tube, the volcanic steam vents, and the Volcano Observatory, where we saw the lava flow from a good distance. Nate was not only friendly, but knowledgeable. I would recommend this tour for anyone looking to see some Hilo's best attractions. My partner and I had a wonderful time and look forward to coming back soon. This tour was a small group tour for us since we went in the off season, which I love because then it can be even more personalized. Lance was pretty knowledgable about the area and the Big Island, so that was nice and we got to see the sights on the trip that we most wanted to. This was affordable and hit some pretty big highlights of the island all in one day!